Dimensions (W x H x D) 2.75" x 4.94" x 1.28"
The ZOOM II / Laser OWL Test Kit is ideal for LAN managers and installers who need to do simple attenuation tests on their single mode networks. 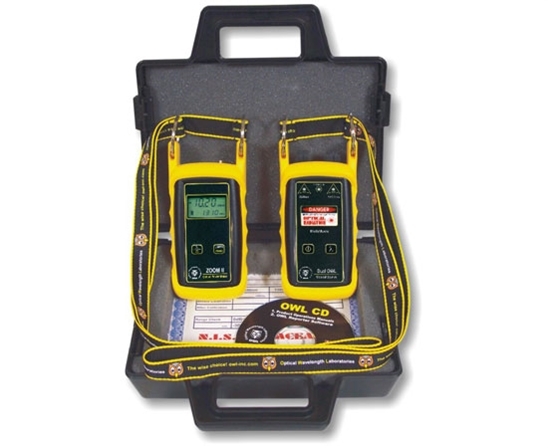 The ZOOM II (Zeroed Output Optical Meter) is an economical fiber optic power meter. It provides accurate testing of multimode fiber cables. The 4-digit 7-segment LED display shows power readings with a resolution of 0.01dB. On-screen indicators display measurement units (dBm, dB, uW), as well as battery life. The ZOOM II comes configured with a 2.5mm universal connector for connection to ST or SC connectors, as well as any other fiber connector with a 2.5mm ferrule. The Laser OWL is a 1310/1550nm NIST traceable single mode light source. Its dual wavelength outputs are temperature-stabilized for accurate measurements.